Lately, I’ve been working on version 3 of my Image Resizer. I think I’m finally narrowing in on the interface design (your feedback is welcomed). The text may change a bit for the final release, and I might add a footer to the dialog, but I’m pretty happy with the way it’s looking. The Advanced settings link will pop up another dialog box that will let you set things like the following. 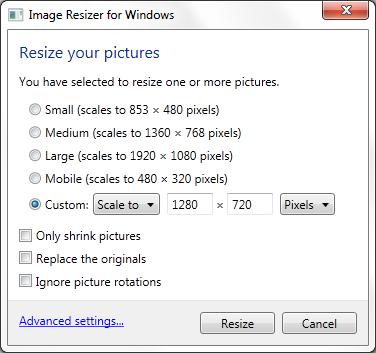 After clicking Resize, it will go to a progress page while your pictures are resized. I intend to make the resize process multi-threaded so if you have more than one CPU, you should notice some good speed improvements for those large resize jobs. When the resize is completed, a summary page will be displayed letting you know of any errors or warnings that occurred during the resize. After the first CTP release, I’ll continue to whittle away at the features, and I’ll keep the CTPs coming until I finally reach feature complete for version 3. Wow, I have a lot of work to do!